Yazdi, M., Moghaddam, R. (2018). A multi-objective vibration damping meta-heuristic algorithm for multi-objective p-robust supply chain problem with travel time. 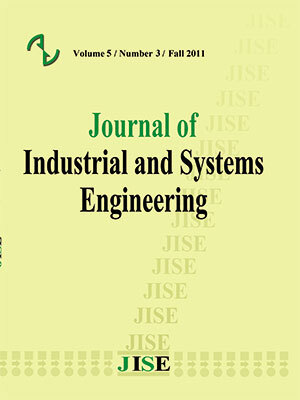 Journal of Industrial and Systems Engineering, 11(Special issue: 14th International Industrial Engineering Conference), 176-189.
mahdiyar khodemani Yazdi; Reza Tavakkoli Moghaddam. "A multi-objective vibration damping meta-heuristic algorithm for multi-objective p-robust supply chain problem with travel time". Journal of Industrial and Systems Engineering, 11, Special issue: 14th International Industrial Engineering Conference, 2018, 176-189. Yazdi, M., Moghaddam, R. (2018). 'A multi-objective vibration damping meta-heuristic algorithm for multi-objective p-robust supply chain problem with travel time', Journal of Industrial and Systems Engineering, 11(Special issue: 14th International Industrial Engineering Conference), pp. 176-189. Yazdi, M., Moghaddam, R. A multi-objective vibration damping meta-heuristic algorithm for multi-objective p-robust supply chain problem with travel time. Journal of Industrial and Systems Engineering, 2018; 11(Special issue: 14th International Industrial Engineering Conference): 176-189. The supply chain network design has a crucial role in decreasing total transportation cost. On the other hand, the value of some effective parameters, such as established facilities cost and demand, often is uncertain. In this regard, a multi-objective multi-commodity scenario-based supply chain model in the presence of disaster is proposed. Minimizing the probability of travel time exceeded at a pre-specific threshold value in different scenarios is defined as the objective function. In addition, failure probability and budget constraint can be considered as other innovations of this paper. A multi-objective vibration damping optimization (MOVDO) algorithm is developed to solve large-scale instances of the presented problem. The obtained results show that a 75-node network can be solved. Amiri, A. (2006). Designing a distribution network in a supply chain system: Formulation and efficient solution procedure. European journal of operational research, 171(2), 567-576. Anaraki, A. Z., Jeihoonian, M., Pazoki, M., & Navaei, J. A BENDERS DECOMOSITION APPROACH FOR A PRODUCTION-DISTRIBUTION NETWORK DESIGN PROBLEM. Dasci, A., & Verter, V. (2001). A continuous model for production–distribution system design. European Journal of Operational Research, 129(2), 287-298. Hajipour, V., Mehdizadeh, E., & Tavakkoli-Moghaddam, R. (2014). A novel Pareto-based multi-objective vibration damping optimization algorithm to solve multi-objective optimization problems. Scientia Iranica. Transaction E, Industrial Engineering, 21(6), 2368. Hajipour, V., Mehdizadeh, E., & Hinojosa, Y., Kalcsics, J., Nickel, S., Puerto, J., & Velten, S. (2008). Dynamic supply chain design with inventory. Computers & Operations Research, 35(2), 373-391. Kannan, G., Sasikumar, P., & Devika, K. (2010). A genetic algorithm approach for solving a closed loop supply chain model: A case of battery recycling. Applied Mathematical Modelling, 34(3), 655-670. Mastrocinque, E., Yuce, B., Lambiase, A., & Packianather, M. S. (2013). A multi-objective optimization for supply chain network using the bees algorithm. International Journal of Engineering Business Management, 5(Godište 2013), 5-38. Mehdizadeh, E., & Tavakkoli-Moghaddam, R. (2009, May). Vibration damping optimization algorithm for an identical parallel machine scheduling problem. In Proceeding of the 2nd International Conference of Iranian Operations Research Society, Babolsar, Iran. Melo, M. T., Nickel, S., & Saldanha da Gama, F. (2003). Largescale models for dynamic multicommodity capacitated facility location. Mohammadi, M., Jolai, F., & Tavakkoli-Moghaddam, R. (2013). Solving a new stochastic multi-mode p-hub covering location problem considering risk by a novel multi-objective algorithm. Applied Mathematical Modelling, 37(24), 10053-10073. Mokashi, S. D., & Kokossis, A. C. (2003). Application of dispersion algorithms to supply chain optimisation. Computers & chemical engineering, 27(7), 927-949. Nozick, L. K. (2001). The fixed charge facility location problem with coverage restrictions. Transportation Research Part E: Logistics and Transportation Review, 37(4), 281-296. Pan, F., & Nagi, R. (2013). Multi-echelon supply chain network design in agile manufacturing. Omega, 41(6), 969-983. Pishvaee, M. S., Rabbani, M., & Torabi, S. A. (2011). A robust optimization approach to closed-loop supply chain network design under uncertainty. Applied Mathematical Modelling, 35(2), 637-649. Rabbani, M., & Yousefnejad, H. (2013). A novel approach for solving a capacitated location allocation problem. International Journal of Industrial Engineering Computations, 4(2), 203-214. Syarif, A., Yun, Y., & Gen, M. (2002). Study on multi-stage logistic chain network: a spanning tree-based genetic algorithm approach. Computers & Industrial Engineering, 43(1-2), 299-314. Thanh, P. N., Bostel, N., & Péton, O. (2008). A dynamic model for facility location in the design of complex supply chains. International journal of production economics, 113(2), 678-693. Zhou, G., Min, H., & Gen, M. (2002). The balanced allocation of customers to multiple distribution centers in the supply chain network: a genetic algorithm approach. Computers & Industrial Engineering, 43(1-2), 251-261.